Along with the increasing awareness regarding the health benefits of instant beverage premixes, the ease of usage offered by them is also fueling the demand for these premixes significantly across the world. The growing number of working people, who do not have time to cook, are increasingly relying on readymade preparations to feed themselves. This factor has emerged as the key driving force behind the rising demand for instant beverage premixes. Analysts expect this trend to remain steady over the coming years. In 2014, the global opportunity in the instant beverage premixes market stood approximately at US$60 bn. increasing at a CAGR of 5.70% during the period from 2015 to 2021, it is expected to touch US$85.8 bn by the end of 2021. The global market for instant beverage premix spreads across Europe, North America, Asia Pacific and the Rest of the World. In terms of revenue, Asia Pacific emerged as the key contributor in 2014 with a share of 34.4% in the overall market. The growing demand for these premixes in countries such as China and India has been boosting their sales in this region since the last few years. By 2021, the Asia Pacific instant beverage premix market is likely to grow to touch US$27.7 bn, retaining the region’s leadership. The growing influence of developed countries and the rising disposable income of people in Asia Pacific is anticipated to drive up sales of these premixes in the region. However, a slight decline is expected in the market share of Asia Pacific in the coming years. Europe emerged second in the overall market in 2014 with a revenue of US$16.9 bn. The development of distribution channels and the increasing interest of consumers in instant beverage premix is influencing this regional market positively. Among all premixes, instant coffee is experiencing the strongest demand across the world. Since coffee has been the most preferred beverage across the world for quite some time, its instant counterpart has capitalized significantly over its widespread popularity. In 2014, the opportunity in instant coffee premix was worth US$30.4 mn. Analysts project this segment to remain the most popular amid all segments throughout the forecast period. Instant tea has also gained considerable attention from beverage consumers around the world. The extensive popularity of tea in several Asian countries, such as China and Japan, has been propelling the sale of instant tea premixes substantially in the recent times. Ito En Ltd., Keurig Green Mountain Inc., The Republic of Tea Inc., Dunkin’ Brands Group Inc., Suntory Beverage & Food Ltd., Starbucks Corp., The Coca-Cola Co., PepsiCo Inc., Monster Beverage Co., and Ajinomoto General Foods Inc. are the key participants in the global market for instant beverage premix. The research report on global instant beverage premix market presents a comprehensive analysis of the market including the historical data and forecast figures. The report further elaborates on the demand and supply approach, manufacturing capacities, product segmentation, recent developments, and vendor analysis of the global instant beverage premix market. The study also includes market drivers, opportunities, restraints, and challenges to be faced in the global market. According to the research study, the growing awareness among the population regarding health is one of the major factors that is projected to fuel the growth of the global instant beverage premix market in the coming years. The booming online retail industry has given the global instant beverage premix market a steep boost in recent years. 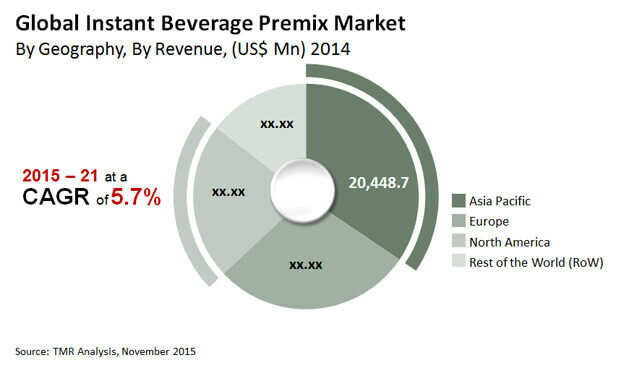 As a result, the global instant beverage premix market is growing at a significant rate. The research study has also added valued inputs and strategic recommendations from professionals and industry experts, coupled with the use of various analytical tools such as Porter’s five forces analysis, SWOT analysis, and value chain analysis, to determine the growth factors and opportunities of the global instant beverage premix market. In 2014, the global market for instant beverage premix market was worth US$59.38 bn and is estimated to reach a value of US$85.80 bn by the end of 2021. The market is projected to register a healthy 5.70% CAGR between 2015 and 2021. Currently, Asia Pacific holds the largest market share in the global instant beverage premix market, followed by Europe. The Asia Pacific market is expected to remain in this position between 2015 and 2021. Based on the product type, the global market for instant beverage premix has been divided into instant health drinks, instant tea, instant milk, instant coffee, soup, and others. Among all these types, in 2014, the instant coffee segment accounted for the largest share in the overall market in terms of revenue, followed by the instant tea segment. This hierarchy is expected to remain the same throughout the forecast period. The high demand for instant coffee can be attributed to the health benefits it provides. Moreover, the fresh and energetic feeling attained after consuming coffee is another factor driving the instant coffee segment. In terms of volume, in 2014, the instant tea segment accounted for the largest share in the global market, followed by the soup segment. The growing online retail industry has played a crucial role in enhancing the distributing channels for several instant beverage premix products. The easy availability of these products on several websites such as Wal-Mart, eBay, and Amazon is further fueling the growth of the global instant beverage premix market. Innovative packaging designs and marketing strategies are other factors attracting several consumers, resulting in high growth of the market. Moreover, increasing disposable income in emerging economies and hectic schedule of consumers are also augmenting the growth of the market. However, entry of cheaper products is a key factor hampering the growth of the global instant beverage premix market. The prominent companies operating in the global instant beverage premix market are The Republic of Tea, Inc., Suntory Beverage & Food Limited, PepsiCo Inc., Keurig Green Mountain, Inc., Ajinomoto General Foods Inc., Starbucks Corporation, The Coca-Cola Company, Dunkin’ Brands Group, Inc., and Monster Beverage Company, to name a few.